Once common in mature forests all over northern New Zealand, hihi, the stitchbird, is a honeyeater-like bird. Its closest relatives are our other “wattle” birds, kokako, huia and saddleback. The hihi had disappeared everywhere from the mainland north of the Waikato by the 1870s, and probably also Aotea. The last mainland sighting was in the Tararua Range in 1883, after which stitchbirds were confined to Hauturu Little Barrier. Our hihi were probably destroyed by rats, due to their preference for nesting in cavities low down in the bush. They need mature forest to survive the winter, feeding differently from the more aggressive bellbird and tui. This is one reason why only a few translocations of stitchbirds have been successful. They now live on three more island sanctuaries including Tiri, and two North Island mainland sanctuaries, but there hihi need extra feeding . Recently rat-free Rakitu shares similar forest characteristics to Hauturu. This opens up the possibility of a self-sustaining population of hihi in our back yard once again. Imagine them safely returned here! 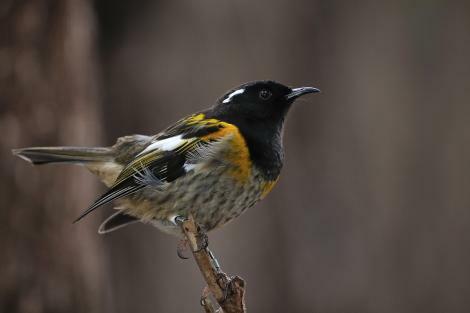 Hihi’s unusual behaviour has lead to it now being classed as the only member of its own family, the Notiomystidae. Big numbers of Kaka this year! It's great to see the big numbers of Kaka around the island this year. We seem to have large number of permanent birds in Fitzroy and I have come used to seeing the same birds. The bird with the one eye in the photo has been coming to my place for over 8 years and I often run into him on tracks I work on nearly 10 kms away. He knows me well. ‘One Eye’ is a typical parrot, very smart. Tell us about your favourite bird, plant or project and we'll print you in the next. Issue. Got a photo? Even better! Two plants you may like to keep a lookout for over the next weeks are the endemic Great Barrier tree daisy (Olearia allomii, below) and the common Sun Orchid (Thelymitra longiflora). The tree daisy is found on some of the higher sites around Great Barrier—Te Ahumata is a good place to look. This small shrub up to a meter high, has thick shiny, dark green leaves with silver colour underneath. The white daisy like flowers have a mauve coloured centre. They are clustered together in a group of 5 to 10 florets. For the next few month there will be a profusion of other Olearia species in flower as well. The Common Sun Orchid Maikuku is found in most sunny places. Clay banks, open scrubland, tracks and road sides. It is not hard to spot. Ranging in colour from white to varying shades of pink. You may even be lucky enough to find some in shades of blue. These are a different species though. The meetings organised by our Local Board’s outgoing Biodiversity Officer Shanti Morgan came up with 4 great ideas for collaborative projects to help our island’s ecology. They include a community nursery, protecting the coastal broadleaf forests of Tryphena, looking after the Medlands dunes and, maybe, the wetland behind, and also a cat free North Barrier. The newly appointed coordinator, Rendt Gorter, will take up the reins and coordinate these. You can expect to hear more once he works out how to fill Shanti’s shoes. Thanks Shanti for your commitment to getting on top of those pests and helping people understand more about our special Aotea ecosystems, plants, critters and birds. PS. Look out for more from Shanti on Aotea’s many fresh water fish soon! Late in 2017 Predator Free NZ 2050 allocated some funds to GBIET to establish a trap “library” on Great Barrier for use by our community. Last summer we gave out 200 trap boxes and a similar number of snap traps. Thirty five people have been recipients and we expect this year that demand should go through the roof. As the boxes were particularly popular another order has been placed and will be available at the New Year’s Day Picnic (Sports Club in Claris) and the Fitzroy Family Fest (Sat 5th January). Traps will be on sale for $7.50.